What does it mean when the Grocery Manufacturers Association, which represents the world’s packaged food and drink industry, puts out a defensive press release about a documentary before it is released? I’d say it means they are scared, and, after viewing the new film Fed Up, I can understand why. 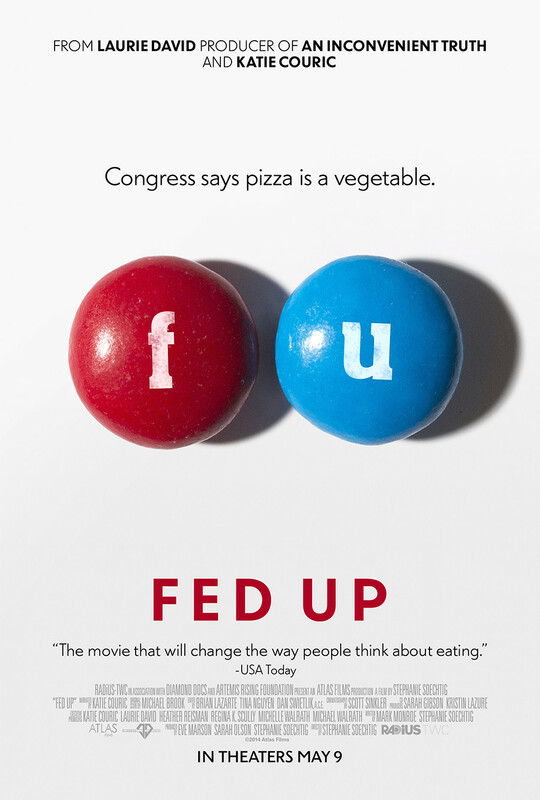 Fed Up (Note: I am on the film’s advisory board) takes an unvarnished look at America’s unrelenting epidemics of overweight, obesity and related chronic disease by following the lives of several articulate and unusually introspective overweight children who struggle with bullying, their health and repeated attempts at weight loss. Another myth busted is the presumption that thin people, thanks to their weight control, are healthy. Turns out that a poor diet, high in sugar, salt, fat and plenty of junk food, can cause the same serious health problems for trim people that we are seeing in the overweight population. That in itself should be an eye-opener to any normal-weight consumer of the standard American diet who smugly thinks that he or she is not on the path to chronic disease. Ultra-processed, empty-calorie food, with its irresistible holy trinity of sugar, salt and fat, is what Big Food does best, according to Fed Up. “We now have the science to show you can make food hyper-palatable so we come back for more and more,” says former FDA Commissioner Dr. David Kessler. The fact that this nearly addictive, ultra-processed food is everywhere (including vending machines, cafeterias, offices, malls, supermarket end caps, corner stores, hospitals, magazine racks, gyms and schools) and is marketed relentlessly, 24/7, to both adults and children as young as 2 years old, only exacerbates the problem. One of the best segments in the movie is when Couric interviews Lisa Gable, president of the food industry-funded Healthy Weight Commitment Foundation on its much-touted, but unproven, claim that industry has eliminated 1.5 trillion calories from the marketplace. When Couric asks Gable what has been pulled from shelves to eliminate those calories, she gets a series of industry talking points designed to bamboozle, but never an answer. Turns out that the elimination of 1.5 trillion calories won’t make much of a dent. It equals a mere 14 fewer calories a day for every adult and child in the U.S. The film’s focus on sugar as the obesity epidemic’s nutritional villain is the movie’s only weak point. Added sugars in virtually every ultra-processed food (particularly sugary drinks) have certainly contributed mightily to overweight and chronic disease and must be reined in. But so have refined carbohydrates, which also turn to glucose in the body. And portion sizes are now so out of whack (e.g., the large fast-food soft drink of 32 ounces) that over-consumption is the norm. The biggest concern is that, if you give the food industry a singular scapegoat — such as added sugars — they’ll find a way to manipulate the message, profit off of it, and still sell junk. Junk food will always be filled with empty calories and questionable chemicals, whether it’s low-fat, low-carb, low-sodium or low-sugar. The key to healthy eating is cooking and consuming real food that comes from the field, not the factory, and rejecting industry’s ultra-processed junk like the plague. The creators of Fed Up have ensured that message comes through, loud and clear, and the movie will hopefully spark a return to the types of meals our grandmothers used to cook and serve. This first appeared in Food Safety News.